The Black Crown is an important symbol of the Karmapa, the Lama that heads the Kagyu school of Tibetan Buddhism. The crown signifies his power to benefit all sentient beings. Legend tells that in a previous eon, in a former life as an accomplished (yogi), the Karmapa attained the eighth level or bhumi of the bodhisattvas. At this time, 100,000 female buddhas (dakinis) manifested their hair as a crown, and offered it to the Karmapa as a symbol of his accomplishment. The Karmapas were traditionally the teachers of the successive Emperors of China. When the 5th Karmapa Dezhin Shegpa met the Chinese Emperor Yung Lo, the Emperor, through his devotion and spiritual realization, was able to perceive Karmapa in the Sambhogakaya form of Vajradhara (Tib. 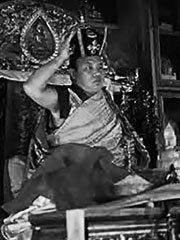 Dorje Chang), wearing a black crown on his head. The Karmapa explained to the Emperor that he could see the ‘Vajra Crown’, the power-field of widom-energy that always stays above the Karmapa’s head. The emperor offered to have a physical replica made so that others could receive its blessing.A crown encrusted with precious stones and topped by a huge ruby was commissioned, and using this, the 5th Karmapa started the tradition of the Black Crown Ceremony which was performed by successive Karmapa incarnations up to the time of the 16th Karmapa, Rangjung Rigpe Dorje. In preparation for the ceremony Karmapa meditates to become inseparable with Chenrezig, the Buddha of Compassion. A mandala offering is made, followed by the seven branch prayer. This is to accumulate good impressions for the ceremony that ensues. Karmapa then places the crown on his head while reciting the mantra ‘Om Mani Peme Hung’, transmitting blessings to each participant in the ceremony to the extent that they are capable of receiving them. In the early 1960s, the 16th Karmapa brought the Black Crown and other valuable relics of the Kagyu Lineage to Rumtek monastery in Sikkim. They remained there in safekeeping until 1993 following the 16th Karmapa’s death. The ensuing split in his lineage caused a the conflict at the monastery between supporters of the two rival claimants for the title of Karmapa. Since this time, it is said that many valuable items have disappeared from the cloister. The location and integrity of the Black Crown is currently unknown.